Today on Amazon.com, many of the most popular video games being sold are first-person shooters. In “Call of Duty”, for instance, players can take on the role of either a U.S. or British soldier who is sent to military “hot spots” to defeat the world’s most dangerous enemies. Like other games in its genre, the images are near lifelike and the violence can be graphic. As the level of violence in video games has increased, so has concern for the effects on those who play – especially those who play a lot. Some have tried to establish a link to school shootings in recent years, pointing out those that have been carried out by avid gamers, and their choice of dark and violent games. But even in these cases: which comes first? Can aggressive and violent behavior be attributed to violence in video games? Or do those who play already have violent tendencies which draw them to violent games? It’s a type of “chicken or the egg” debate that has strong advocates on both sides. Indeed, violent video games have become increasingly mainstream, so any connection between graphic games and acts of real-life violence are hard to prove. Though video games made their appearance in the 1970s, it wasn’t until systems like the Sony PlayStation were released in the 1990s that violence became an issue. Along with these more sophisticated systems came the ability to make graphics more lifelike. The more lifelike they’ve become, the more interest there has been in the attempt to understand a correlation between violent games and violent behavior, if indeed one exists at all. One of the primary concerns with violence in video games is that gaming is not passive. In order to play and win, the player has to be the aggressor. Rather than watching violence, as he might do on television, he’s committing the violent acts (albeit in a simulation). Most researchers acknowledge that this kind of active participation affects a person’s thought patterns, at least in the short term. Another factor that concerns both researchers and parents is that violence in video games is often rewarded rather than punished. In army and sniper games, players compete with each other based in part on how many people they kill. If played frequently enough, games like this can skew a young person’s perception of violence and its consequences. In 2002, researchers Anderson and Bushman developed the General Aggression Model (GAM). Often considered one of the formative contributions to the study of violence and video games, the GAM helps explain the complex relationship between violent video games and aggressive gamers. The GAM takes some (though not all) of the heat off video games by acknowledging that a gamer’s personality plays into how he is affected by violence. Anderson and Bushman refer to three internal facets — thoughts, feelings, and physiological responses — that determine how a person interprets aggressive behavior. Some people’s responses are naturally more hostile, making them predisposed to respond more aggressively to violent video games. Short-term effects were easily identified in the GAM; the most prominent being that violent games change the way gamers interpret and respond to aggressive acts. Even those who aren’t predisposed to aggression respond with increased hostility after playing a violent video game. The game becomes what’s called a “situational variable” which changes the perception of and reaction to aggressive behavior. 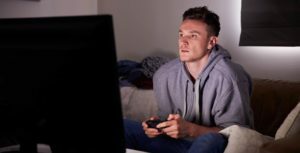 The American Psychological Association (APA) have made their own attempt to get to the bottom of the connection between violent games and acts of aggression in young people. However, like many before, the APA researchers concede that more research is still needed before firm conclusions can be drawn. Complicating matters is that it is rare for a single factor to trigger acts of violence. Therefore, a nuanced approach is necessary to understand how violent video games may act in tandem with other potential risk factors for violence. The APA concluded that violent video games are indeed linked to increased aggression among players. However, they also point out that evidence linking this aggression to actual violence and delinquency is lacking. Critics in the scientific community have also questioned whether a link exists at all. They argue that studies to date have been plagued with shortcomings, for instance by relying too heavily on self-reported data about aggressive acts. They also point out that even when studies do establish a connection, that connection is often very weak. This suggests that other elements of a young person’s environment are likely to be stronger predictors of aggression than the use of violent video games. Nevertheless, some research findings do present stark dilemmas to parents. Researcher Jay Hull has been one of the most prolific contributors to the scientific literature underpinning violence and video games. One of the most interesting finds in Hull’s studies is that children who regularly play violent video games are more likely to be sent to the principal’s office for misbehavior. In the study, regular players were twice as likely to be punished in this way compared to infrequent players. Hull believes that violent video games may normalize rule-breaking and interfere with a child’s ability to recognize right from wrong. Long-term effects of violent video games are still uncertain and are fiercely debated. Few long-term studies have been conducted to date, so there are only hypotheses. Anderson and Bushman theorized that excessive exposure to violent video games causes the formation of aggressive beliefs and attitudes, while also desensitizing gamers to violent behaviors. Though long-term effects haven’t been clinically documented, one need only look at the way video game violence has progressively increased over the past two decades to get a sense of potential long-term effects. Parents would be wise to monitor the amount of time their kids spend gaming and watch closely for any negative effects. At this stage, the best strategy for parents is to carefully check age ratings to make sure that the games their children play are age-appropriate. The Entertainment Software Rating Board (ESRB) website offers an online tool providing concise information on the age rating of a game, its content, and the nature of the gameplay. Our article on video game ratings is another useful place to start for parents seeking to understand the different rating categories and find gaming titles suitable for younger children. We also recommend taking advantage of the large amount of gaming footage uploaded to YouTube to view content from the games your children are playing or wish to play. The more informed you are, the easier it is to apply your discretion in approving or selecting video games for your child. The connection between violence in video games and in the real world remains controversial. What is sure is that more long term research is needed to understand the way in which video game violence affects the developing brain. Does violence in games really desensitize young people to real world violence? Does this desensitization actually trigger individuals to carry out violent acts? And if so, why does it occur in some people and not others? The jury remains out on these critical questions.